With a capacity over 50% higher than the Borough Assembly Hall, it take long to work out that bigger acts and productions could take place in the new building. As each year went by, it seemed that there was a production that became the biggest in Friars history until trumped the following year by a bigger one! Consequently Camel who couldn't any longer appear at the Borough Assembly Hall, could easily be accommodated at the new hall and was probably the biggest production of 1975. 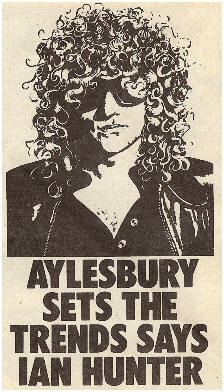 The first edition featured the late Warren Harry on the front. In 1977, the Vale Hall was renamed the Maxwell Hall in honour of the late councilor Reg Maxwell. 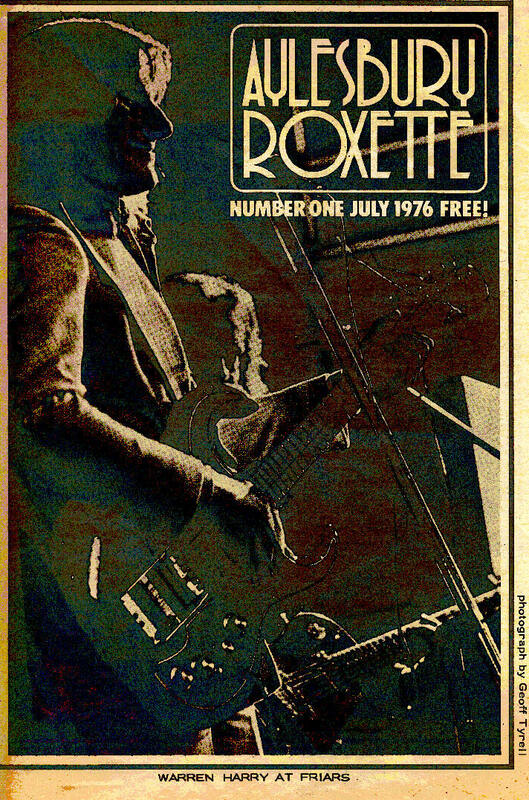 By 1978, Steve Hackett had stolen the production honours for the biggest lighting, sound and equipment rig. In 1979 Gary Numan's massive fluoresent lighting towers had stolen the honours and by 1980 this was trumped well and truly by Genesis and then the last night with Paul Weller was pretty big. As for the biggest gig (excluding the free Otway gig below), that honour falls to The Clash who successfully played at Stoke Mandeville Stadium sports hall in 1982 to 2000 people. In 1978, an interesting experiment paid off. 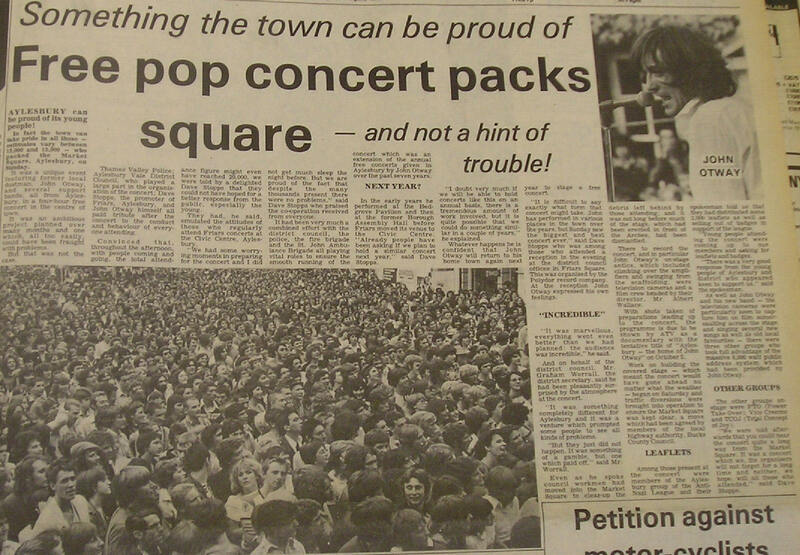 Friars had been involved in previous free gigs at Rabans Lane, but the Open Air Otway event in the Market Square attracted up to 20,000 people, was peaceful, and was filmed and broadcast on ITV. The caring side of Friars was highlighted locally and nationally for the way the sales for the highly prestigious 1980 Genesis and 1982 Police gigs were handled with people sleeping all night in the cattle market featuring on local TV news as well. 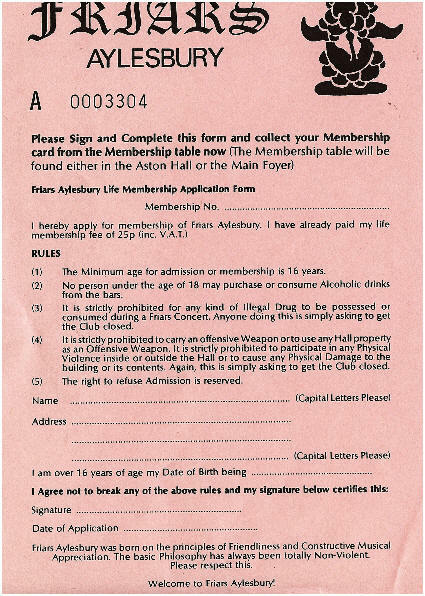 Friars should also take a lot of credit for the risks it took putting on successful gigs by The Clash and Sham 69 in 1978/79 when (underserved) reputation alone saw every council around Aylesbury ban these acts. I think most observers would agree that Friars seemed to stutter a little in the final two years, particularly in 1984 when no decent bands seemed to be touring. 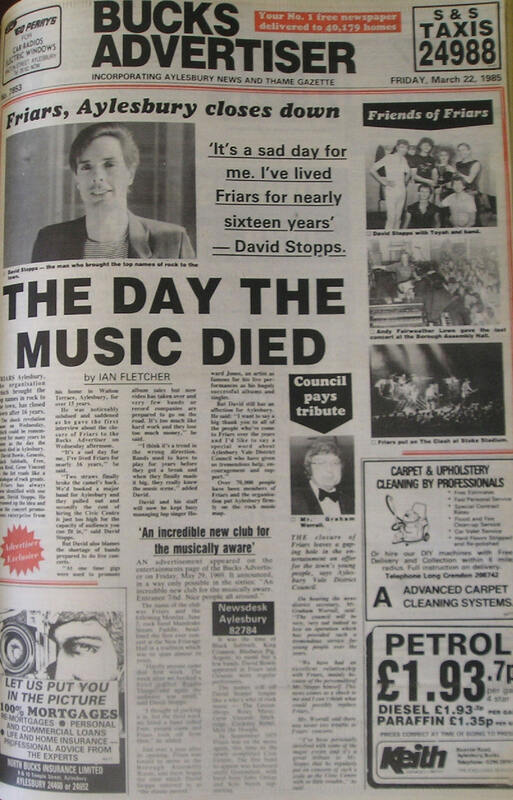 But the headline that brought Friars to an end would have shocked most members and it indeed made headlines in the national music press. We needn't add any more to this headline - enjoy this website and remember and appreciate what you saw in this sleepy old town. Some of the text is blurry due to copying limitations, but remember that headline and remember that you helped bring Friars back.